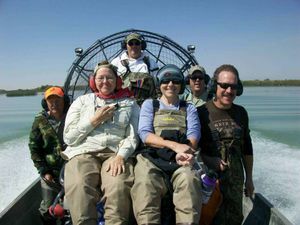 Idaho Master Naturalists riding in an airboat on Mud Lake WMA on their way to help with capturing and banding ducks. Idaho Master Naturalists have a great time experiencing life as a biologist and truly helping wildlife and the environment. You can become a Master Naturalist too! Photo courtesy Idaho Department of Fish and Game. IDAHO FALLS – The most active chapter of Idaho Master Naturalists (IMN) in the state is announcing registration for its 6th wave of certification classes. In order to become a master naturalist, each participant is required to take part in the initial 40-hour certification and then participate in 20 hours of training annually, along with time volunteered on projects. Last year the seven IMN Chapters in the state provide a total of 14, 850 hours of service, the Upper Snake Chapter alone provided 6,611 of those! The Idaho Master Naturalist Program mission is to develop a corps of well-informed volunteers to work actively toward stewardship of Idaho’s natural environment. Volunteer activities include assisting Idaho Fish and Game biologists with raptor monitoring, fisheries management, habitat restoration, migratory bird surveys, opportunities to support educational activities at regional wildlife management areas, and many more. Members also do volunteer work for the Bureau of Land Management (BLM), United States Forest Service (USFS), United States Fish & Wildlife Service (USWFS), Nature Conservancy, Teton Regional Land Trust, and other nature orientated organizations. The Upper Snake Chapter of the Idaho Master Naturalists will be starting the 2015 certification classes March 3, 2015. Classes are held every Tuesday night from 7:00 till 10:00 at the Idaho Falls Fish & Game office and run through the first week of June. Each class is led by a different specialist in a field related to the outdoors. Classes cost $85 for individuals or $100 for couples willing to share class materials. For more information on their many activities visit the web page at idahonaturalist.org<http://idahonaturalist.org>, or see them on Facebook at Upper Snake Chapter, Idaho Master Naturalists; for information on registering for the upcoming class call 524-0383 or email tony.appelhans@gmail.com<mailto:tony.appelhans@gmail.com>. Applications are available at the Idaho Fall Fish & Game office and should be submitted by February 14th, 2015.